I have said it many times I know, but I LOVE to serve food in spaghetti squash “bowls”. Part of this is that it is fun (and makes for good presentation of the food itself), but part of it is, much as it pains me to admit it, laziness. There is no need for me to use a fork to pull the squash flesh into the spaghetti like strands this way as everyone can do it themselves as they eat the sauce that I have piled into the “bowl”. It takes less time, and I have less risk of burning myself while handling those hot squash. And I really do think this is an improvement as it means that you do not need to take time to pull those “spaghetti” strands – you just fix the sauce, put it in the “bowl” and dinner is done. When you are cooking a recipe like shrimp scamp, this is especially useful as the shrimp can be served at peak “cooked-ness”. It will not overcook and get tough and rubbery while you pull the squash. 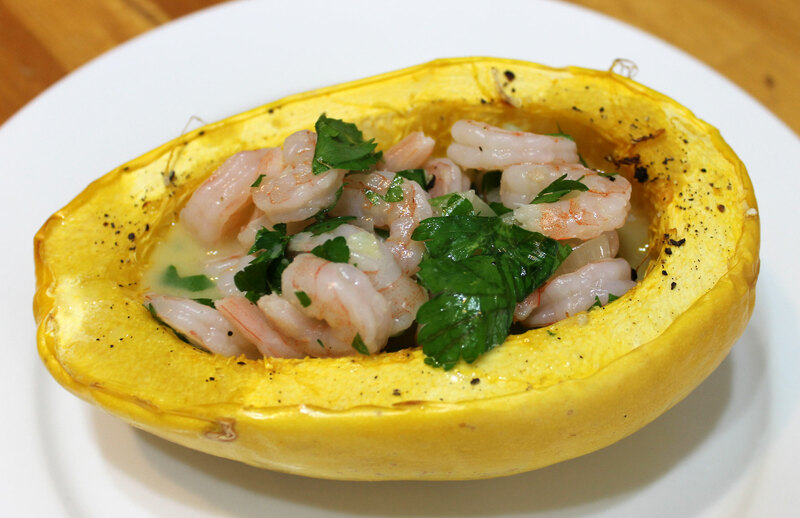 But the squash will also not get cold while you cook the shrimp… it just makes for a far less stressful dinner! And lets face it, part of the paleo lifestyle is reduction in stress…. The first thing you are going to do is to halve your spaghetti squash and deseed them (I saved my seeds as I am hoping to grow my own spaghetti squash this year – if it is successful I will let you know!). 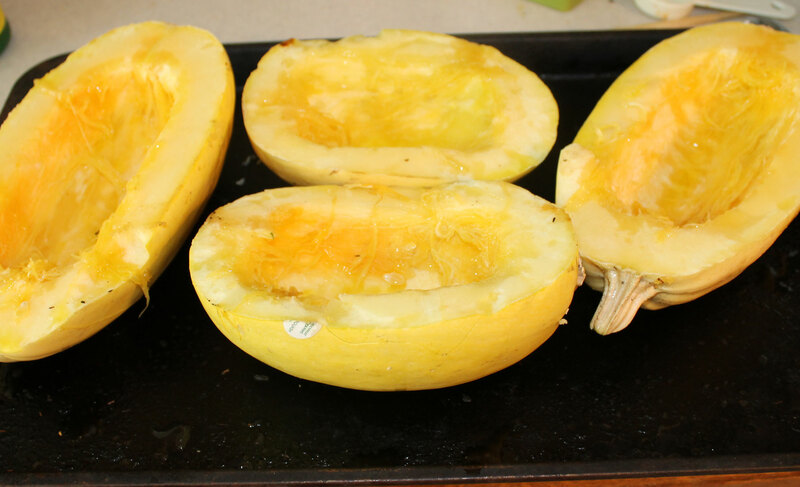 Cook the squash in a preheated 190°C (375°F) oven as posted here…. 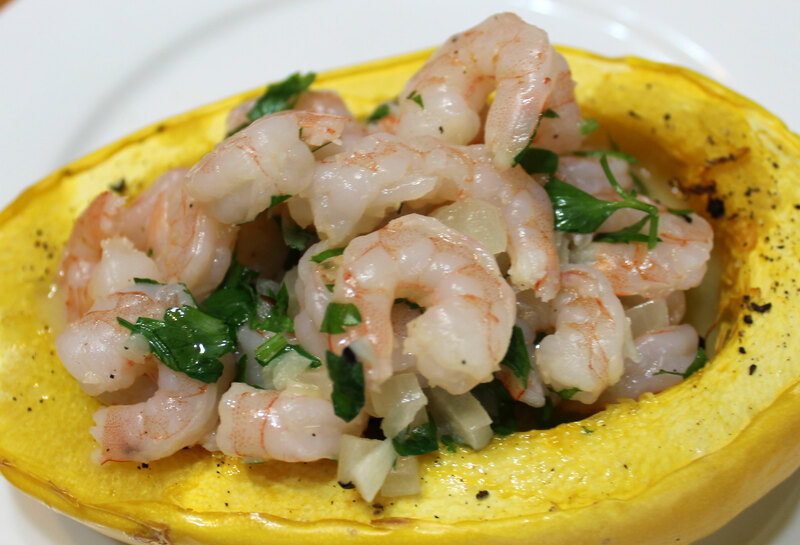 Once the squash is done, remove them from the oven and leave to rest while you cook the shrimp. Melt the coconut oil (or butter/ghee if using) in a large pan and add the olive oil. Add the onions and garlic and cook 1-2 minutes until softened. Add the bone broth. Let the liquid bubble to reduce until half the quantity remains (5-10 minutes). Add the shrimp, lemon juice and zest, then taste and season with sea salt. Toss until all the shrimp are pink and cooked through (about 5 minutes). Sprinkle with parsley. Pile the shrimp in the cooked spaghetti squash and serve at once. 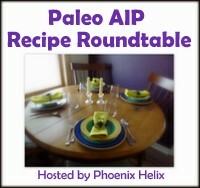 This entry was posted in Autoimmune Protocol Foods, Paleo Autoimmune Protocol, Recipes and tagged AIP freindly, dairy-free, gluten-free, grain-free, low carb, paleo, paleo "pasta", primal, shrimp, spaghetti squash, spaghetti squash bowls. Bookmark the permalink. great idea and looks delicious!!! we’d love you to stop by our blog if you have time — we have lots of paleo/primal friendly dishes and provide the nutrition info for most of the ingredients that we use too! I just made this tonight -but I cooked some spinach and spooned it into the squash before piling on the shrimp & sauce. Delicious!! Thanks!